We want to make your stay as comfortable as possible in a pleasant, family atmosphere. The apartment is one of 3 apartments in an original Oldenburg doghouse (certain architectural style in the early 1900's). The apartment is located in the bright basement and the garden can be shared. My wife and I live in the apartment above. We are happy to give tips on places to visit, restaurants, etc. On the upper floors there is another apartment with three rooms, which can be rented separately. So far we have had really nice and interesting guests. Kitchen with dining area: fridge, stove, oven, kettle, coffee maker, toaster, dishwasher, dishes, pots, pans, etc. The living room area has space for a comfortable air bed for 2. Wir haben eine angenehme Woche in Oldenburg verbracht, die Wohnung ist kinderfreundlich und mit allem Nötigen ausgestattet. An unserem Aufenthalt hat uns besonders die zentrale und doch ruhige Lage gefallen, und der sehr freundliche und zuvorkommende Vermieter. Gerne wieder! Vielen Dank für Euren Kommentar. Ihr seid jederzeit wieder willkommen. Die Wohnung, besonders aber die Gastfreundschaft waren hervorragend. Auf Fragen und Anliegen wurde umgehend reagiert. Absprachen wurden eingehalten und die Erreichbarkeit war stets gegeben. Alles lief unkompliziert ab. Die Lage, sowie die Größe der Wohnung ist sehr gut. It is a spacious ground floor flat (a Little bit downstairs) , very luminous (a lot of Windows in every room) and very comfortable. The owners, Maik and his wife live upstairs. Maik is really nice and he helped me in all I needed. They are very trustworthy and trusting people and they made me feel like an old neighbour of them. The situation of the house is perfect, because it is near the centrum (10 minutes walking) but at the same time it is very quiet. The bus to the university is 7 minutes walking from the house. The nearest supermarket is not very close walking but 7 minutes by cycle. But I think this is a "problem" of Oldenburg itself, because there are not many supermarkets (or food shops) inside the city, compared to other cities. The city is really pretty. both the centrum and the parks. Situated in a very nice and quiet neighbourhood within walking distance from the centre of Oldenburg,this accommodation is much more spacious than shown on the internet.It is fully equipped,very light and clean with a large garden.Since Oldenburg is a great place for cycling 2 bicycles are at your disposal as well. Contact with our host was very punctual and correct,all necessary info was readily available! Vielen Dank liebe Familie van Rossem! Sie waren sehr angenehme und freundliche Gäste und sind uns jederzeit herzlich willkommen. 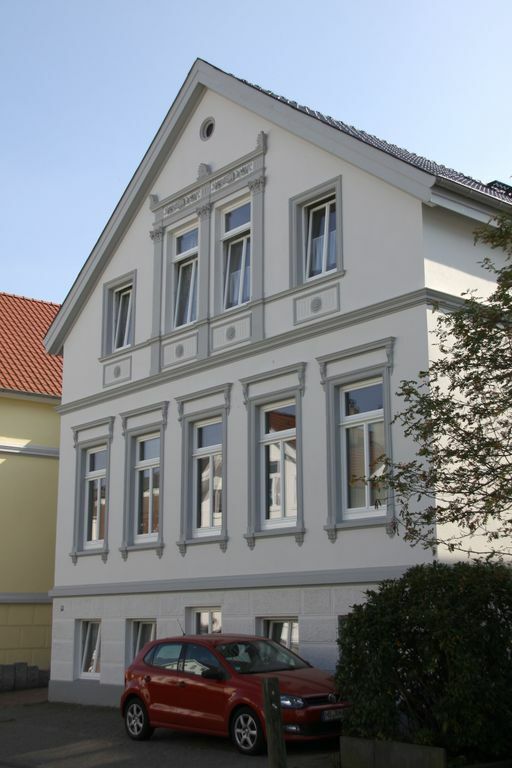 The apartment is located in the center of Oldenburg. It is still very quiet. From here you can explore on foot or by bus. The city center, museums, castle, theaters, cafes and restaurants are within 8-15 minutes. You can take a bus or train to Bremen and the North Sea. Enjoy a day trip z. To Norderney, Borkum, Juist, Langeoog, Wangerooge, Groningen (Holland). Oldenburg is also a good base to explore the surrounding area on foot, by bike, train or by car. You can easily reach various recreational and animal parks, Rhododendron exhibition in Westerstede, Park of Gardens, Bad Zwischenahn with a beautiful lake. Oldenburg itself offers a great downtown for shopping and relaxation, theater, great restaurants, water park with sauna area.